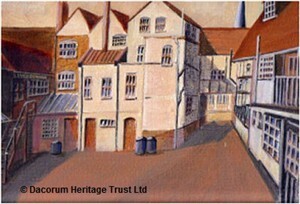 Saddlers | The Dacorum Heritage Trust Ltd. Strictly speaking, a saddler is one who makes saddles, but the term also loosely encompasses anyone involved in the making and maintaining of harness for horses. There are still a few saddler’s shops dotted about, but nowadays they are something of a rarity and a master saddler is very rare indeed. Until the Second World War most of the larger villages had at least one saddler and the towns each had a number of them. The last two in the Hemel Hempsetad Area, both master saddlers, were W.D.Edwards in Kings Arms Yard, Hemel Hempstead and Harry Marks in Water End, both of whom essentially died in harness (forgive the pun) in the 1950s/1960s. 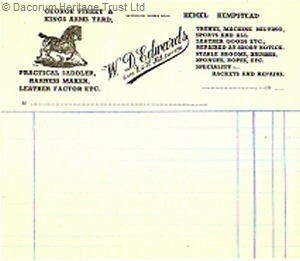 W.D.Edwards (Wally) was born in Highgate in 1888, son of George Edwards from Caister in Norfolk, who was also a saddler. 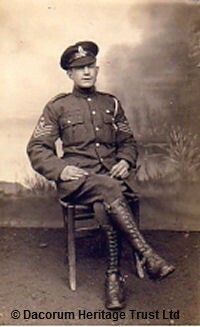 Wally had been a Saddler Sergeant with the Royal Field Artillery, part of the the British Expeditionary Force in France in the Great War and on his return he worked for George Sanger’s Circus for a while, but tiring of being constantly on the move, he eventually settled in Hemel Hempstead, taking lodgings at 12 Herbert Street and working for the Misses E & K Hill, who had a saddler’s shop at 33 High Street, next door to A.J.Chennells the grocers. At the rear of the Hill’s front shop was a first floor saddlery workshop which had separate access (it is still there, up a flight of wooden steps) and when the Misses Hill ceased trading from the front shop in 1922, Wally Edwards continued to run the business from there on his own account for another forty years. Derek Christopher, a life-long enthusiast of all things equestrian, who lived in the area and at various times was a Joint Master of Aldenham Harriers, ran a livery stable at Stags End and a stud at Upperwood Farm on the Gaddesden Estate, was a frequent visitor to both Edwards and Marks and, towards the end of their lives, he bought a lot of their leather workers’ tools, realising that if he wanted his harness repaired quickly and cheaply from then on he would have to do it himself. DHT is delighted that Derek has now donated some thirty of those tools (which in the main date to the late Nineteenth Century) to the collection and they will be displayed as soon as the opportunity arises. Acknowledgements to Eric Edwards for this article.